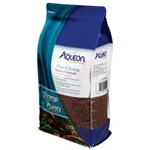 Aqueon Plant and Shrimp Aquarium Substrate is an ideal choice for freshwater aquatic environments. Made with a clay-based material, its unique spherical shape maintains its form over time and doesn’t breakdown into compressed soil. The shape allows for newly budding and mature plants’ root systems to grow and flourish; and an excellent option for aquascaping freshwater aquariums.